Best Dutch Oven 2019 | With so much choice, which is best? If you have never heard of a Dutch oven, you are definitely missing out! This amazingly versatile piece of cookware can truly do it all… From braising to brewing and even baking! Traditionally, this heavy-duty pot was used for slow cooking meat and veggies, but once you try it, you’ll realize you can truly use it for anything. A dutch oven is basically a large, heavy-duty cooking pot with a tight-fitting lid. Dutch ovens were traditionally made of cast iron, but modern versions are often made of cast aluminum and other materials, as we’ll see in this guide. No matter what they are made of, Dutch ovens usually have thick walls that allow them to retain heat really well and handles on the side that makes lifting this heavy pot easier. While Dutch ovens were originally used for cooking on hot coals, you can use modern Dutch ovens to perform a variety of cooking techniques. In fact, one of the best things about Dutch ovens is the fact that they can be used with almost any heat source. You can place one on the stovetop, in the oven, on a grill with the hood down, and even above a campfire, although Dutch ovens used for camping usually have short legs attached to the bottom. A lesser known fact is that Dutch ovens can also be used for baking. In fact, bread baked in a dutch oven is unlike anything you have tried before. Finally, since they are quite thick and sturdy, Dutch ovens can stand high heat reasonably well which makes deep frying inside them possible. Overall, a Dutch oven is an investment that is definitely worth the price. By now, you certainly understand how much we love a good Dutch oven. If you are interested in getting one for yourself, you should definitely keep on reading. 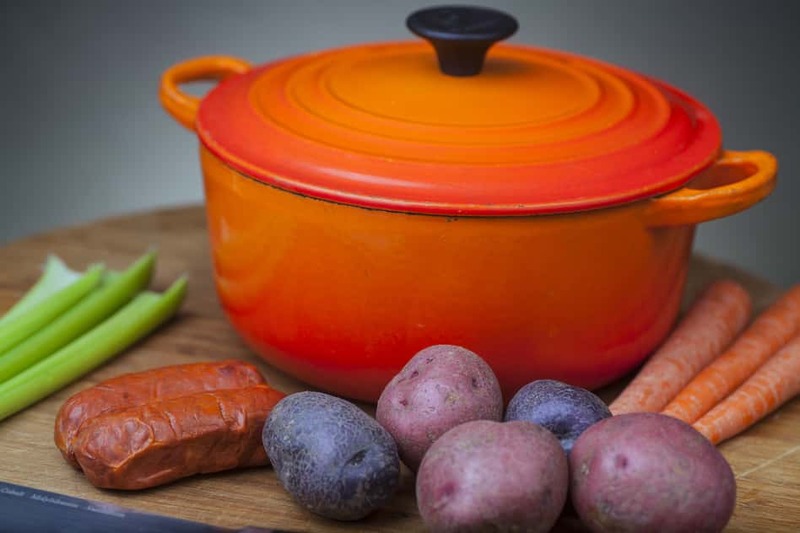 We have tried and tested a variety of these babies in order to come with this list of five best Dutch ovens available on the market today! Most Dutch ovens you see are made of cast iron, but this one brings us something a little different, but probably just as amazing. 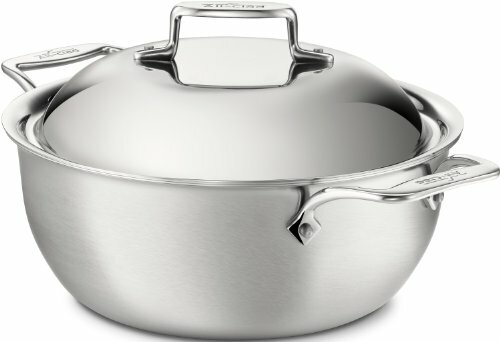 This is a beautiful stainless steel Dutch oven with a round bottom and a capacity of 5.5 quarts which is quite generous. We’ll go into the details in a bit, but first, we need to say a few words about the manufacturer that made this beautiful piece. 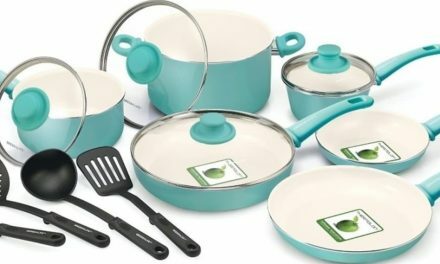 All-Clad is an American company with a long-lasting reputation of making high-quality cookware. Their origins can be traced back to 1967, the prime time of the U.S. steel age. They started as Clad Metals, a company that focused on perfected the technology for bonding metals. Today, All-Clad Canonsburg, Pennsylvania, and they still use American-made steel just as they did decades ago when they started. The “clad” part in the name All-Clad refers to the process of bonding two or more different metals together. All-Clad actually works with various combinations of metal, but the D5 line to which this Dutch oven belongs combines aluminum and steel in five alternating layers. 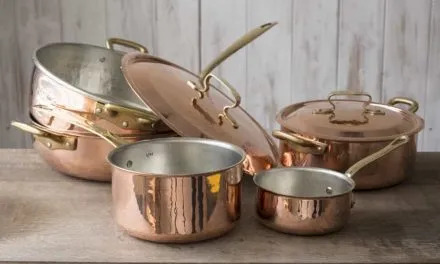 The five layers of metal allow the pots and pans from this collection to provide amazing cooking performance every time! But what is the point of layering stainless steel and aluminum? Well. every layer is there for a reason. The cooking surface and the external layer are made of high-grade 18/10 stainless steel. The stainless steel cooking surface is perfect for browning meat before braising, for example, and it’s also perfect for caramelizing foods. Moreover, stainless steel is extremely resistant to corrosion and rust and super easy to clean. Because the internal and external layers are made of indestructible stainless steel, you can even put this Dutch oven in the dishwasher. Just a reminder – you could never do this with a regular cast iron Dutch oven. However, stainless steel is not a very good conductor of heat. This why the aluminum layers are there. Aluminum conducts heat quickly and evenly and the heat is easily transferred to the stainless steel cooking surface. Finally, the layer in the middle, between the two aluminum layers, is made of steel again which prevents the pan from warping and makes it even more durable. The All-Clad BD55500 D5 5-Ply Bonded Dutch Oven also features two nice looping stainless steel handles that are securely riveted. 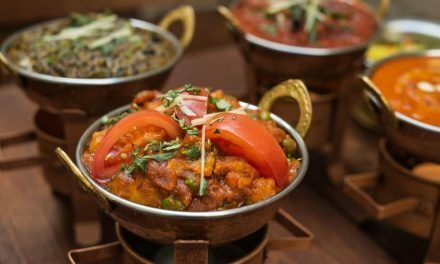 The pot also comes with a tight-fitting lid, also made completely out of stainless steel. Since all parts are made of metal, this Dutch oven is completely oven-safe too. Actually, the manufacturer’s recommendation is to use it in the oven at temperatures up to 600 degrees Fahrenheit, but this is probably because temperatures higher than this are almost unreachable and highly unnecessary if you are not trying to scorch your food. Overall, this is an amazing piece of cookware to have in your kitchen. You can use it for anything, from braising to slow cooking to baking, and the cleanup has never been easier. If you find cast iron Dutch ovens overly heavy, this is definitely the right choice as it is much lighter but performs just as well. Enameled cast iron cookware is what Le Creuset is known for. They introduced their first enameled cast iron cocotte as far back as in 1925. While almost a century has passed since then, they still make amazing enameled cast iron pieces. The Le Creuset Signature Enameled Cast Iron Round Dutch Oven has a cast iron core, but it is covered with a beautiful enamel coating. Cast iron is a great material for a Dutch oven because it retains heat really well, but uncoated cast iron requires a specific cleaning routine. Luckily, the enamel coating on the Le Creuset Signature Enameled Cast Iron Round Dutch Oven makes cleaning a breeze! Besides making cleaning easier and preventing the food from sticking, the enamel coating on Le Creuset cookware also looks amazing! The interior coating is creamy white, but when it comes to the enamel on the exterior of this Dutch oven, you can choose from a variety of colors that Le Creuset offers which really gives a special feel to this piece of cookware. Moreover, the coating on this Dutch oven is high-quality enamel. It will not start peeling or chipping off, and it can last for many years. Another detail we liked about this Dutch oven is the design of the handles. It has two loop handles on the sides that are larger than the handles on most similar products. Since the handles are quite large, it is not hard to grasp them even with oven mitts on. This is actually very important since this pot is rather heavy – it weighs 11.2 pounds. A tight-fitting cast iron lid is also included, which is a necessary part of any Dutch oven. The lid has a stay-cool phenolic knob on the top, but don’t worry, the knob won’t melt if you put your Dutch oven in the oven. In fact, both the pot and the lid are oven-safe up to 500 degrees Fahrenheit. This Dutch oven from Le Creuset is a truly wonderful piece of cookware. It is also incredibly versatile. It can be put in the oven, to slow-cook a pot roast for example, but it also works with all kinds of cooktops, even induction. We really love the fact that you can use it for anything, from baking to deep frying. 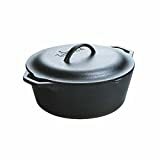 If you have a picture in your head about how an old-school cast iron Dutch oven should look like, you are probably imagining something very similar to this 7-quart Dutch oven from Lodge. Lodge has actually been around for more than a century, and not much has changed in the way they make cookware since the beginning. The fact that the classic design has withstood the test of time really tells us something – it tells us that their pots and pans really work well! This is certainly true when we’re talking about the Lodge 7-Quart Pre-Seasoned Cast Iron Dutch Oven. This Dutch oven is made of 100% cast iron. The thick cast iron body allows the pot to retain heat amazingly well, which is basically the whole point of Dutch ovens. There is a nice pouring spout on one side that really comes in handy when you want to pour liquids out. The two loop handles on the sides are cast in place which basically means they will never fall off. This Dutch oven also includes a lid, of course, which is made of cast iron too and has a nice handle large handle at the top. Now, you might have heard that cast iron is difficult to clean. The truth is, it’s not that difficult, you just need to care for your cast iron cookware in a specific way. Cast iron cookware needs to be seasoned before use to prevent rust, and it should never be cleaned with soap or put in the dishwasher. 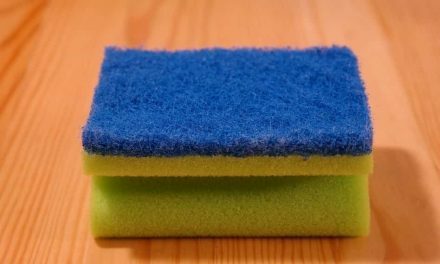 Other than that, the cleaning process is really easy – you just need to wipe the residue off. Moreover, Lodge cast iron cookware comes pre-seasoned, but don’t worry, they don’t put any artificial coatings on their pots and pans. Pre-seasoned just means that the pot has been covered with vegetable oil in order to protect it. If you are looking for a classic, old-school Dutch oven this piece from Lodge might just be the right choice. To be honest, the rustic design makes us think of barbecues and afternoons grilling over an open fire, but this doesn’t mean this is all this little baby is capable of. It will perform just as well in a conventional oven, and since it’s magnetic (it’s made of iron) it will work on induction cooktops or any kind of cooktop for that matter. As we have already mentioned, Lodge is a company with a long-standing reputation of making high-quality cast iron products. Most of their skillets and pots feature a traditional design, and they also make most of their products with uncoated cast iron. However, with this Dutch oven, they decided to step up the game and make a beautiful cast iron Dutch oven with enamel coating. Both the pot and the lid are coated with enamel paint, the coating being creamy white on the inside, and colorful on the outside. You can actually choose your favorite from a range of colors offered by Lodge which is always an advantage of enameled cookware. Moreover, enameled cast iron means you get all the benefits of cast iron without having to follow the specific cleaning and maintenance routine that raw cast iron requires. The enamel coating is non-reactive and super easy to clean. The porcelain enamel used to coat this Dutch oven actually refers to glass particles that have been fused to the cast iron body. For this reason, the coating won’t melt or get damaged at high temperatures – this Dutch oven can be safely used in a conventional oven at temperatures up to 500 degrees Fahrenheit. 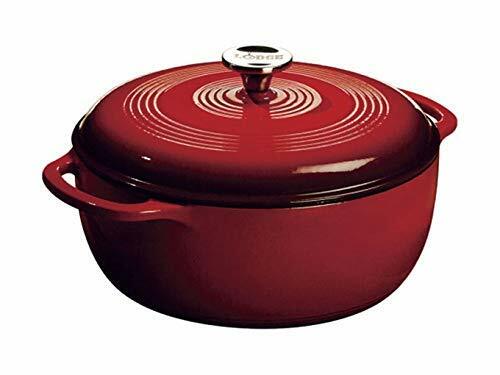 The Lodge 6-Quart Enameled Cast Iron Dutch Oven features two looping handles on the sides which are quite convenient. The lid is also made of cast iron and fits tightly to the pot, thus locking in the moisture when needed. The lid comes with a stainless steel knob at the top. Finally, this Dutch oven has even been rated dishwasher-safe, but hand washing is still recommended if you want the enamel coating to last as long as possible. 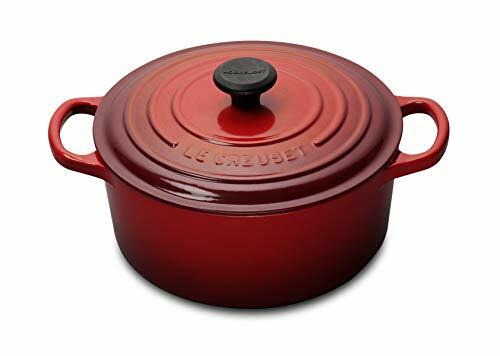 This enameled cast iron Dutch oven is quite similar to Le Creuset infamous enameled cast iron Dutch ovens, but it comes at a fraction of the price. Overall, this is a great piece of cookware with all the necessary features. It also looks really nice so it can be quite useful for serving food too. This Dutch oven from Calphalon provides the perfect balance between traditional and modern design. It is made of stainless steel which has been bonded to an aluminum core using high-heat, high-pressure impact bonding. The aluminum core is made of heavy-gauge aluminum, and it goes all the way up the sides of the pot, thus providing amazingly even heat distribution. While aluminum distributes heat nicely and evenly, the stainless steel interior and exterior layers make sure that this Dutch oven lasts for years. They also make it super easy to clean this piece, and you can even put it in the dishwasher if you want to. The exterior features a beautiful brushed finish, while the cooking surface is super smooth and polished. The polished cooking surface is perfect for searing and browning meats, for example. 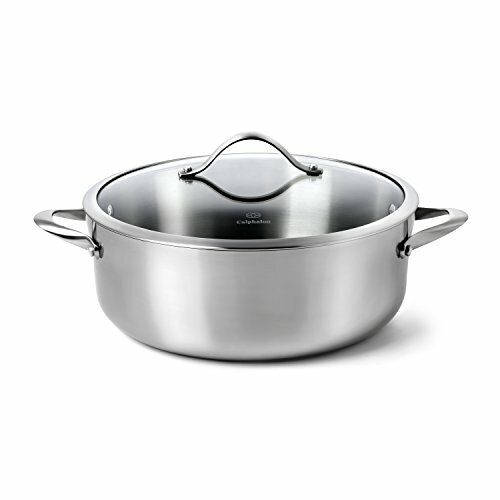 The Calphalon Contemporary 8-Quart Stainless Steel Dutch Oven has a rather large capacity of eight quarts. If you like making food in large batches or cook for a large family on a regular basis, you’ll definitely find this useful. Being made of stainless steel instead of cast iron, this large Dutch oven weighs just below 10 pounds, so if you don’t like cookware that is overly heavy, you’ll find this pot comfortable to use. 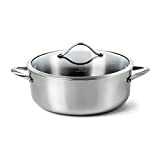 The handles on the Calphalon Contemporary 8-Quart Stainless Steel Dutch Oven are made of brushed stainless steel too, which makes the pot completely oven safe since all parts are made of metal. The handles are securely riveted and quite large. Moreover, they remain cool on the stovetop which a really nice feature since you can move this Dutch oven without using oven mitts. This Dutch oven comes with a lid too, of course. The lid on this one is made out of tempered glass with a stainless steel rim and a nice looping handle on top that is made of stainless steel too. When using this Dutch oven on the stovetop, the glass lid is quite fun to use, since you can actually see what’s going on in the pot. However, it requires a bit of care when placing in the oven, even though the lid is rated oven-safe. Namely, you should let the lid heat up slowly as it might shatter if exposed to extreme temperature changes. Ideal for searing and braising meats, browning meats for savory stews, and preparing delicious soups. Domed lid with inside points allows continuous self-basting for flavorful meats. This Dutch oven from Calphalon might just be the perfect pot for a modern kitchen. It is much lighter than cast iron Dutch ovens, but it still provides amazing heat distribution thanks to the aluminum core. It looks amazing too, thanks to the brushed stainless steel exterior and the tempered glass lid that complements it nicely. 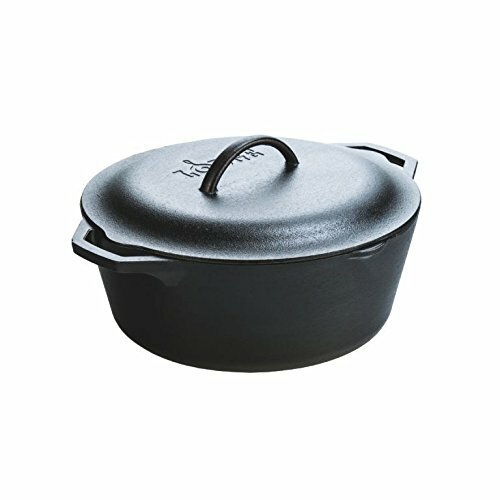 What is the best Dutch oven out there? It is a hard question to answer! Dutch ovens are amazingly versatile, but some materials are better than others for specific purposes. Cast iron has been traditionally used for Dutch ovens, and there are some very good reasons for this. On the other hand, enameled cast iron Dutch ovens like the Le Creuset Signature Enameled Cast-Iron 5-1/2-Quart Round French (Dutch) Oven and the Lodge 6-Quart Enameled Cast Iron Dutch Oven combine the benefits of a cast iron body with an exterior that is as easy to clean as stainless steel. Finally, for those of you who like to use Dutch ovens in their everyday cooking, cast iron might not even be the best option. If you opt for a stainless steel version, like the All-Clad BD55500 D5 Brushed 18/10 Stainless Steel 5-Ply Bonded Dishwasher Safe Dutch Oven with Domed Lid or the Calphalon Contemporary 8-Quart Stainless Steel Dutch Oven you’ll be able to wash your Dutch oven in the dishwasher on a regular basis without worrying about damage. Ultimately, it all comes down to personal choice, but we are convinced that all five Dutch ovens on our list today have their advantages.